I’m a high school student in Alaska. We spend more time practicing for a mass shooting than for an earthquake. Ariana O'Harra is a junior at Anchorage East High School. They call us the "Mass shooting generation." That's the headline that sticks with me the most. Not the counts of the dead, not the headlines declaring Nikolas Cruz to be mentally unstable, not even the ones that list how many mass shootings have occurred. It's that my generation, the kids that are choosing what to do with our lives, preparing for prom, getting our driver's licenses, applying for our first job, are now growing up in a world where we've been labeled "Most likely to die in school." We have drills for an active shooter. I live in Alaska, and we prepare more for a school shooting than we do for an earthquake. In Alaska, where the oft-quoted statistic is that there's a rumble in the ground every three minutes, we're more worried about getting shot at in our place of learning. We practice barricading the doors. We practice running for our lives. We practice how to fight back. We're training for combat, training for what to do when bullets come flying. My greatest worry at school isn't getting picked on or failing a math test. It's whether I'll make it out alive if an attacker comes into my school with an AR-15. All of my peers have discussed it: Where we would go, how we'd fight back, the best place to hide. It's scary to talk about mass shootings with my peers, but it's even scarier that it's something that could happen to us. It's become a fact of life. We, the "Mass shooting generation," have been forced to accept that as reality. There have been more than 200 students killed in school and university shootings since Sandy Hook, roughly five years ago, according to the Chicago Tribune. We train in drills, huddling quietly in dark classrooms as school administrators fire off blanks so we get used to the sound of gunshots. We talk about where the safest spot to hide in a classroom is, and we joke about using objects like water bottles as weapons. The day after 17 people died at Marjory Stoneman Douglas High School, one of my teachers went over mass shootings and what to do. She told us that unless the shooter was in our hallway, we'd evacuate. She warned us that we'd be having another ALICE training soon, (ALICE stands for Alert, Lockdown, Inform, Counter, Evacuate – it's a new active shooter response training program) and that it was just protocol. It's our second training this year. 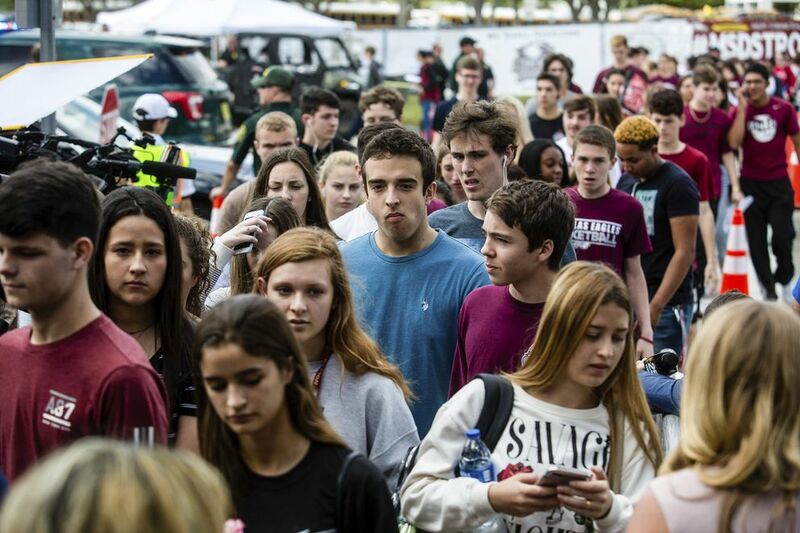 The truth is, even with preparation, even with training, even with our administration's best efforts to prepare us for this, if a gunman were to enter my school, the result would likely be catastrophic, as it would for any other school in this nation. ALICE trains us to fight back, to rush the shooter as soon as they get in the classroom, to maximise our chance of survival, but all of us know the truth: if a shooter is in the same room as us, people are going to get hurt. People might die. And here's the thing. If we can attack the shooter, keep them occupied, it gives the cops more time to get to us. It keeps the shooter out of other classrooms where they could do more harm. That's the reality American children are faced with: a world where we, the students, must mitigate the tragedies, when they should have been stopped long before they ever reached our doors, when they never should have had the chance to even start to happen at all. And while 150,000 students have had to experience a shooting since the Columbine High School massacre in 1999, our elected officials have received millions in direct donations and campaign funding from the NRA, as of Oct. 4, 2017. The top ten recipients in the House and the Senate on the list got a total of $47,114,952. Sen. Marco Rubio, of Florida, where 17 students and faculty members died Feb. 14, received $3,303,355. Our leaders are ignoring the deaths of this country's children because the NRA is pouring millions of dollars into their election campaigns. Simply put, the people elected into office, who have sworn oaths to do right by this country, are putting the funding of their reelection campaigns over the lives of American students and American citizens. It's no secret that Republicans generally campaign for less strict gun control laws, and Democrats for more, but this is an issue that extends far beyond the political lines of parties. This is an issue that affects our entire country. If you have a child in school, you should support stricter gun control laws, funding for mental health services, a better background check process, anything that keeps weapons out of our schools. In Japan, where you must pass a written test, mental health evaluation, background check, and attend an all day class before you may own a gun, there are barely ten gun deaths per year, in a country of 127 million people. Both the UK and Australia instituted massive buyback programs, and both experienced a massive drop in gun-related deaths – in homicides and suicides. I support people having the right to own weapons, to go hunting with or to protect their families. What I don't support is the ease with which we get them. I don't support people owning an AR-15, the rifle that was used in Parkland, and in Sandy Hook. And I don't think that someone's right to own an AR-15 eclipses someone else's right to live. I am 17. Next year, I will be applying for college. I think I want to be a photojournalist, but I'm not 100 percent sure. I also like science and history. My best friend wants to go into sports medicine. Last week, we spent an hour discussing prom dresses, and boys, and how stressful our AP classes are. We also talked about what we'd do if a gunman got into our schools, and how awful what happened in Florida is, and how awful it is that 17 people had to die because our country does nothing. Our elected officials continue to take money from the NRA, because the funding they get is more important to them than the lives of my peers. Every day we wonder if this is the day someone with a gun will come and take away our futures. Our lives are just beginning, and everyday we have to face the fact that we may die, simply because people think that their right to own weapons like AR-15 rifles are more important than our right to life, liberty and the pursuit of happiness.